The site www.frenchriviera-tourism.com was created by the CRT (Comité Régional du Tourisme Riviera Côte d’Azur). The site complies with French and international legislation on intellectual property and copyright law. All reproduction rights reserved, including for iconographic and photographic documents. Reproduction of this site, even in part, is expressly forbidden without authorization from the CRT (Comité Régional du Tourisme Riviera Côte d’Azur). In accordance with the French law of 6 January 1978 relative to information, files and freedom, the site is officially registered with the CNIL (Commission Nationale de l’Informatique et des Libertés), under number 87 1973. In accordance with Article 34 of the French personal information protection law ("Informatique & Libertés" #78-17 of 6 January 1978), users are entitled to access, modify, rectify or delete any personal data. 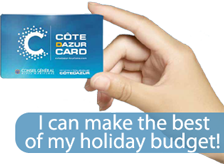 You may do so by contacting the CRT Riviera Côte d’Azur) by e-mail (info@cotedazur-tourisme.com) or by mail (NICT Dept.). The information mentioned in the Comité Régional de Tourisme Riviera Côte d'Azur website are communicated for information only and in no way engage the latter’s responsibility. It is forbidden to copy, download, transmit or distribute any data, databases, illustrations, logo, etc. for the ViaMichelin® geolocalization module in any manner whatsoever, except for personal use and for non-commercial purposes. Users cannot hold the Comité Régional de Tourisme Riviera Côte d'Azur responsible for any damage, direct or indirect, accessory or resulting from use of the Services and Content of ViaMichelin® geolocalization module.